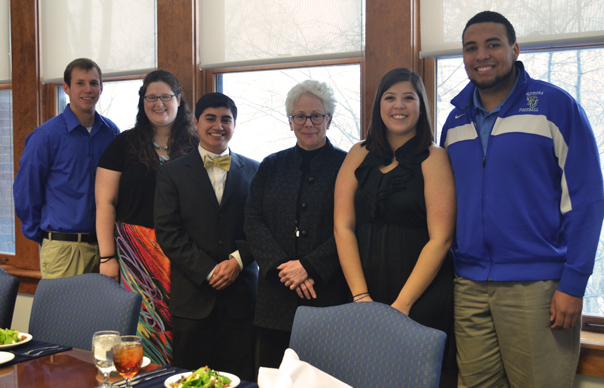 (pictured left to right) Phillip Vertin, junior actuarial science major; Rachael Downing, junior elementary education major; Hector Velazquez, sophomore, political science major; Dr. Rebecca Sherrick, President, Aurora University; Dulce Heelan, junior health science major; and Michael Walker, junior athletic training major. To celebrate Career Development Month, Aurora University Career Services encouraged students to dress professionally through a contest held every Tuesday during November. Each Tuesday, participating students, who were dressed in professional attire and were spotted on campus by a faculty or staff member, received a raffle ticket for a chance to win lunch with Aurora University President Dr. Sherrick. On Tuesday, February 26, the five winners collected their prize. During the lunch, students had the opportunity to practice their dining etiquette and meet with Dr. Sherrick. Do your homework. Understand what your industry defines as professional attire. For example, in the banking world professional attire means a dark suit, a starched white dress shirt, a conservative tie and wing-tip shoes. While in the more creative world of software design and development, professional attire means jeans/khakis and a sweater or collared shirt. When in doubt it is better to err on the side of overdressing or dressing more conservatively. Give yourself time to build a new wardrobe. How you dress for your new career will most likely be different than how you have dressed as a student. Begin buying professional pieces at least a year prior to graduation. This will allow you to stretch your money by shopping sales, buying end of the season clothes at a discount, and rummaging through resale and thrift shops. Think about asking for professional clothing and a briefcase for birthday, graduation and holiday presents. Invest in a few classic well-made pieces. When purchasing more expensive items such as a suit or a briefcase, select styles that are more classic than trendy. A classic suit will not go out of style making your initial financial investment pay off over a longer period of time. Cleanliness counts. Make sure your clothes are clean, pressed and fit properly. You won’t create a good impression wearing a suit that is one size too small or looking like you slept in your outfit. Make sure collars don’t look faded, sweaters aren’t pilling, there are no holes at the seams and there are no stains. And don’t forget to polish your shoes. Some still judge people’s character based on the quality of their shoes. It is all in the details. What you wear is important to cultivating your professional image. You want to show that you belong in your chosen industry. Don’t forget to pay attention to your hairstyle, fingernails and for women – makeup. Keep color palettes conservative and make sure you look well-groomed. For more information on Aurora University Career Services, email career@aurora.edu or visit us at aurora.edu/career.